Most women want to have beautiful nails, but that shouldn’t mean sacrificing your health to get them. 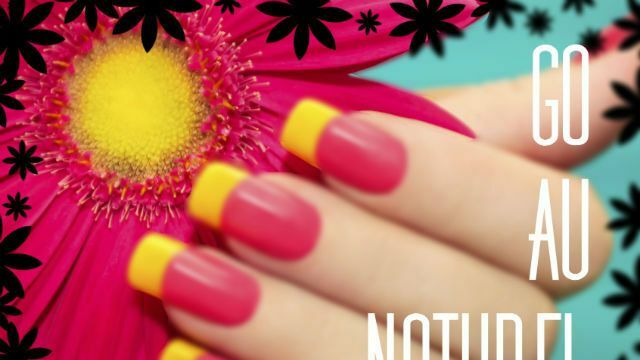 Turning to acrylic nails means being exposed to all sorts of harmful chemicals, including resins and formaldehyde which have been shown to cause cancer in addition to resulting in the loss of your real nails. 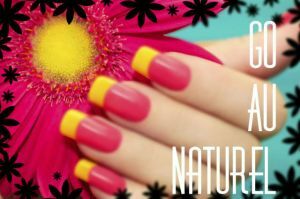 Fortunately, there are a number of ways to keep your own nails naturally beautiful. Moisturize. Moisturize your cuticles every day to prevent hangnails, splitting and peeling. Coconut oil is a great natural moisturizer – massage it into your cuticles just before bed to stimulate blood circulation, which can even aid in nail growth. Use a fine-grit cushion file. To shape your nails, only use a fine-grit cushion file, as it is more gentle on the skin around the nails. Don’t use a metal file, and avoid coarse-grit files, which are meant for artificial nails as they’re too harsh on natural nails. Buff your nails. Buffing the nails with a super-fine grit, four-way buffer helps to shape them, remove ridges and provider a smoother nail surface that makes nails shine without polish – but don’t buff them too much. Over-buffing can cause friction, which can weaken nails. Buffing in an “X pattern,” by lifting the buffer between strokes, is best. Avoid exposing nails to harsh chemicals. Using household cleaners or any harsh chemicals can dry out your nails and your hands. If you must use a chemical-filled household cleaner, always wear gloves. The best choice is to only use natural cleaners, such as a vinegar-based solution. Don’t bite your nails or use them as tools. This weakens and can break the nails. Go with non-toxic nail polish. While nail polish can help protect nails and prevent breakage, using a non-toxic version is best. The Environmental Working Group created Peacekeeper Cause-Metics as the safest paint-based natural nail polish. Other good options include Suncoat, Piggy Paint and Honey Bee Gardens. The most important thing is to avoid nail polish that contains DBP (Dibutyl phthalate), formaldehyde or toluene. Battling nail fungus. Fungus can cause the nail to turn thick, discolored and even crumbly. If a fungus develops, try using tea tree oil. This is a powerful antiseptic that can be as effective as any prescription antifungal medicine. Use a drop or two on the nail once or twice a day, optimally just after bathing when the skin is softest. If the fungus is on your toenails, be sure to change into a fresh pair of socks as soon as possible when the feet get sweaty, and don’t clip your cuticles, as this removes the nail’s protective barrier, making it easier for fungi and bacteria to get into the base of the nail. Pay attention to your diet. What you eat, or don’t eat, affects everything in your body, including your nails. If your nails are brittle or flaking, you may need more essential fatty acids, which are found in foods like flaxseed, flaxseed oil and fish like wild-caught salmon. If your nails have white spots, you may have a zinc deficiency. Eating nuts, root vegetables and shellfish can help. There is no reason to shell out your hard-earned cash and sacrifice your good health by making trips to the nail salon. By following these tips, you might just find everyone envying your beautiful nails!